Shortly after our last meeting, John Craven passed away. He will be missed. We all arrived in time for the start of our annual luncheon. Some were dressed for the St Patrick's Day celebration that weekend. Others were just happy to get together. Dr Mike led us in a prayer of thanksgiving and we all enjoyed our meals. After a short business meeting we cut our 25th anniversary cake and offered a cake mold for anyone who wanted it. Attending: Dr Mike and Pat Lurakis, Ed Ramming, Joan Bishop, Bill Keller, Stephen Condiff, Jack and Ann Proud, Donna and Larry Grady, Lou and Rose Riciardi, Al and Bobbie Schmidt, Brian and Clair Steager, John and June Seltner, Ned Young, Phil and Suzanne Hatrack, Bob and Patti Moffit. Ed Ramming. Pres. called the meeting to order at 2:10 P.M. with a flag salute and the Pledge of Allegiance. President Ed Ramming thanked Dr Mike for the invocation and Donna for her work on arranging this luncheon. Treasurer: Donna Reported all bills are paid. 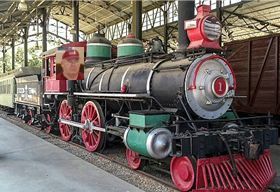 Sunshine: Patty Reported she sent 3 birthday cards and 2 thank you cards (Jim Shourt and Ed Ramming for their work on the Thomas controllers) in January. In February she sent 3 birthday cards and 1 feel better card. Newsletter Editor: Our new member, Dan has agreed to help Al with the newsletter and our web site. Spring Open House: We discussed and agreed to set this year's open house date for Saturday, May 18th. Please let Al know if you will be participating. Late note on this item. We have 2 locations, Jim Holt, Green Planet and Al Schmidt. We can advertise this as an Open House Day, but a tour won't work unless we have more locations. End Note for This Meeting: We finished the meeting reminiscing about the special times we had over the past 25 years in shows at Ocean City, Cold Spring, Greenberg Show in Pennsauken, Atlantic City, Cape May Airport, Shore Mall (a very long running show) Paulsboro, Richland, Vineland our Open house tours and of course our meetings at our members' homes! **Names listed with show dates are contact people in addition to the Show Coordinator, if you would like to participate. We now have a business card that we hand out to people who inquire about our club. Please pick some up, if you can and hand them out to anyone who you think may be interested.